Coastal Andhra (Kōstā āndhra), is a region in the state of Andhra Pradesh, India. This region was part of Madras State before 1953 and Andhra State from 1953 to 1956. According to the 2011 census, it has an area of 92,906 square kilometres (35,871 sq mi) which is 57.99% of the total state area and a population of 34,193,868 which is 69.20% of Andhra Pradesh state population. This area includes the coastal districts of Andhra Pradesh between the Eastern Ghats and the Bay of Bengal, from the northern border with Odisha to south of the delta of the Krishna River. Coastal Andhra has rich agricultural land, owing to the delta of the Godavari and Krishna rivers. The prosperity of Coastal Andhra can be attributed to its rich agricultural land and an abundant water supply from these two rivers. Rice grown in paddy fields is the main crop, with pulses and coconuts also being important. The fishing industry is also important to the region. The state of Andhra emerged to a political power during the reign of Maurya Dynasty. Megasthenes mentioned that Andhra was a flourishing empire of the Satavahana's from the times before christ. Coastal Andhra was also ruled by the famous Chalukyas in between the period of the 7th Century and the 10th century CE. This period was followed by the reign of many other dynasties such as the Cholas, the Kakatiyas as well as the Vijayanagar Empire. According to 11th century inscriptions, coastal Andhra is bounded by Mahendragiri mountains (in north-eastern border with Gajapati district of Orissa), Kalahasti temple (in Chittoor district near the border of Nellore district), Srisailam temple (in Kurnool district near the border of Mahbubnagar district and Prakasham district). Coastal Andhra is located to the east of Telangana and Rayalaseema regions bordered by Odisha to the North and Rayalseema and Tamil Nadu to the south and Telangana to the west. The coastal line of this region is the second largest in India, extending 960 km. The Gajapati and Ganjam districts of Odisha were granted to the French East India Company around 1752. Later they were transferred by the French to the British. Nellore, which extends as far as Ongole Taluk, was later received from the Nawab of Arcot, under an establishment. Some parts of present-day Nellore and Chitoor were in the hands of Venkatagiri Rajas. The British made an arrangement with the Raja of Venkatagiri in 1802 to claim power in those territories also. Currently, Coastal Andhra comprises nine districts. Coastal Andhra is rich in cultural and linguistic identities throughout the region. Coastal Andhra hosts six dialects of Telugu: Srikakulam, Visakhapatnam, Godavari, Krishna, Ongole and Nellore. Parts of this region are ruled by different rulers, leading to diversity within the region. Coastal Andhra in turn can be divided into Northern Region (Srikakulam, Vizianagaram and Visakhapatnam districts), Central Region (East Godavari, West Godavari, Krishna and Guntur districts) and Southern Region (Prakasam and Nellore districts). Methods of food preparations, level of spice and compositions vary from each subregion. The total area of the region is 92,906 km2 with a population of 34,193,868 as per 2011 census. The literacy rate stands at 63%. The main languages spoken is Telugu by majority. Other languages spoken are Hindi, English and Tamil. Coastal Andhra hosts six dialects of Telugu: Srikakulam, Visakhapatnam, Godavari, Krishna, Ongole and Nellore. Parts of this region are ruled by different rulers, leading to diversity within the region. Classical dance in Andhra may be performed by both men and women; though women tend to learn it more commonly. Kuchipudi is the state's best-known classical dance form. It was born in the Kuchipudi village, of Krishna district, which is in the centre of coastal Andhra. Rice is the staple food in the Kosta cuisine and is usually consumed with a variety of curries and lentil soups or broths. Cuisine of Coastal Andhra is influenced by sea food varieties. Godavari and Krishna districts have numerous varieties of foods, which are famous through the state. Food varieties in some parts of Nellore and Prakasam are influenced by Rayalaseema. Coastal Andhra contains nine districts: Srikakulam, Vizianagaram, Visakhapatnam, East Godavari, West Godavari, Krishna, Guntur, Prakasam and Nellore. Tanguturi Prakasam Panthulu - 1st Chief Minister of Andhra State (Prakasam). Bezawada Gopala Reddy - 2nd Chief Minister of Andhra State (Nellore). Kasu Brahmananda Reddy - 3rd Chief Minister of Andhra Pradesh (Guntur). Bhavanam Venkatarami Reddy - 8th Chief Minister of Andhra Pradesh (Guntur). N.T.Rama Rao - 10th Chief Minister of Andhra Pradesh (Krishna). Nadendla Bhaskara Rao - 11th Chief Minister of Andhra Pradesh (Guntur). Nedurumalli Janardhana Reddy - 12th Chief Minister of Andhra Pradesh (Nellore). K.Rosaiah - 15th Chief Minister of Andhra Pradesh (Guntur). Visakhapatnam, Vijayawada, Guntur, Rajahmundry, Kakinada, Eluru, Nellore, Vizianagaram, Ongole. Other major towns in the region are Machilipatnam, Gudivada, Tenali, Tadepalligudem, Bhimavaram, Amalapuram, Srikakulam, Narasaraopet, Chilakaluripet, Kandukur, Palasa and Chirala. Coastal Andhra is one of the major Buddhist hubs in India after the Gangetic plains in Bihar, Jharkhand and Uttar Pradesh. Many remnants from large monasteries to small stupas are found in this region from Srikakulam district in the North to Nellore district in the South. The major Buddhist Remnant sites in this region are as Amaravati, Salihundam, Ramatheertham, Thotlakonda, Bavikonda, Bojjannakonda, Kummarilova, Kodavali, Bhattiprolu etc. Andhra Pradesh contains 259 coastal wetlands, covering an area of 18,552 km2, out of which 88 are manmade. Lakes Kolleru and Pulicat are the two major lakes in Coastal Andhra. 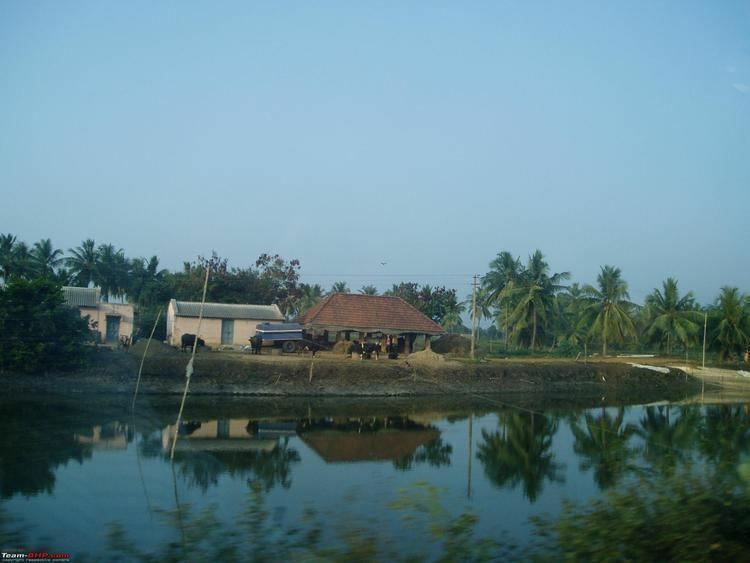 Kolleru, a natural sweet-water lake, is situated in the West Godavari district and serves as a natural flood-balancing reservoir for the two rivers. The lake is also an important habitat for up to 50,000 resident and migratory birds. The lake was declared a wildlife sanctuary in November 1999 under India's Wildlife Protection Act, and designated a wetland of international importance in November 2002 under the international Ramsar Convention. Pulicat is the largest salt water lake in the country, located in Nellore and spreads between Andhra Pradesh and Tamil Nadu. This is one of the famous attractions in south India. In this region, the river Akhanda Godavari splits into several distributary branches, including the Gouthami, Vasishta, Vainatheya, and Vruddha Gouthami, before emptying into the Bay of Bengal. The East Coast Railway (ECoR) serves Srikakulam, Vizianagaram District, and part of Visakhapatnam district including Visakhapatnam City. Vijayawada is the one of the busiest railway junctions in India serving many express trains. There are many bases for the trains to start from this region like Visakhapatnam, Kakinada Port, Kakinada Town railway station, Narsapuram, Machilipatnam, Vijayawada, Guntur, Repalle. The airports in this region are Visakhapatnam Airport which is an International Airport. Two Domestic Airports at Vijayawada Airport and Rajahmundry Airport. Visakhapatnam Port, Kakinada Port are the major ports in Coastal Andhra. The state of Andhra Pradesh is the second maritime state (after Gujarat) in terms of cargo handled. Visakhapatnam Port is the one of the largest cargo handling ports in the country. Krishnapatnam Port at Nellore and Gangavaram Port are major private ports and there are two minor ports at Machilipatnam Port and Nizampatnam Port in Guntur.